Gillian Hovell BA (Hons), is an ancient historian and an archaeologist. 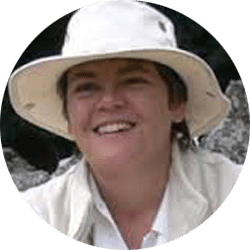 She previously worked at BBC Television and is an award-winning freelance writer, author, and public speaker, specializing in archaeology, ancient history, and prehistory. Gillian is actively involved in digs at major sites, including Orkney’s famous Ness of Brodgar Neolithic site, and she also lectures across the United Kingdom regularly. Gillian holds a degree in Latin and Ancient History from Exeter University in England. Gillian looks forward to sharing how archaeological finds and sites are full of human life and passion, and that history and archaeology are not just about the past, they’re everywhere, and they add color, depth and meaning to our lives today. Gillian is a lecturer at the British Museum in a London and York University. Gillian is author of Visiting the Past: A Guide to Finding and Understanding Britain’s Archaeology, History Press Limited, Third Edition 2015.